Michael Kearney Medical Furniture has been designing and manufacturing to create you comfort for over 30 years. We believe the everyone deserve to sit comfortably in their home, nursing home, hospital and many more other environments. You and they deserve it and have earned it. 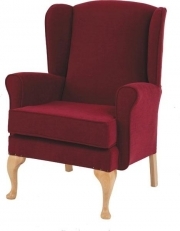 Using the balance of woodwork, upholstery skills and quality foams and materials, ensuring you receive the best Irish made furniture we want you to be assured that you’re buying the best Irish made chairs for the very special people in your care. All our polish is clinically proven to kill 99% of bacteria. All our soft fabrics and vinyl are designed to cope with demands of healthcare environments. Also we provide combinations for high risk areas. Also ask us for our materials for use with anti-chlor and other cleaning chemicals. 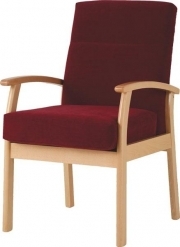 Through design and development we have a high selection of chairs and solutions to your seating needs. From our special designed fluid channels,allowing fluid fall to the floor, protecting your product. Removable seats for easy cleaning. Two sided seat cushion, selection of different foams to create different postures. 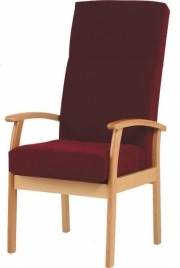 All our chairs are tested to B S standard, strength and stability, with all different sizes and shapes available.